FedEx is one of the major delivery companies within the United States, shipping almost 4 million packages on a yearly basis. This is just in the U.S.; this company is one of the biggest delivery services in the world, with offices all over the globe. They were founded in 1971, and have seen huge growth in the more than 40 years since then. FedEx has a number of job opportunities available, many of them being entry level. Delivery drivers fall into this category, as do package handlers and administrative assistants. Jobs that require more experience include QA specialists, service center specialists, maintenance positions, and management roles. Drivers should expect to start out making around $14 per hour, but pay can go up as high as $25 per hour after a couple of years of experience. Package handlers start out around $9 per hour, but can go up to $14 per hour quickly. Service center reps tend to see a yearly salary starting out around $25,000 per year, but this can go up as high as $45,000 per year with experience and dedication. Managers tend to see a yearly salary beginning at around $30,000. Once your value to the company is proven and experience has been gained, this can go up as high as $80,000, depending on how much you are contributing to the company as a whole. 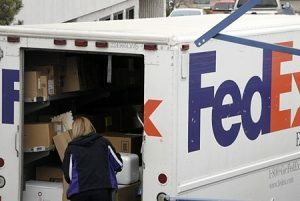 FedEx frequently ranks in the top 100 best companies to work for according to Fortune magazine. There are currently more than 300,000 employees for the company, and they can attest to how good of a job the company does taking care of them. The company provides 401(k) retirement policies, health, vision, and dental insurance, as well as paid vacation time for those that qualify. Millions of people depend on this company for deliveries and this need is not going away either. This fact alone has created a lot of job security within the company. You need to be 18 years old to work for FedEx. Most positions do not require a college degree, but they do require workers to have a high school diploma or a GED. You also need to have a valid driver’s license for most positions. You should have a clean driving record and you should do well when a background check is conducted on you. FedEx employees are expected to be safe drivers and self-directed. This company gives employees a lot of independence, and you should be mature and motivated enough to not take advantage of this fact. Employees are representatives of FedEx no matter what their role within the company might be, and they are expected to act accordingly and carry themselves in a professional manner, even when out in the field. You are expected to meet schedule deadlines and take responsibility for the independence that you are given, as well. The company also reserves the right to drug test job applicants, so being clean in this respect is a must for consideration. To apply to work at FedEx, go to their homepage, and then select your country from their filter screen. The careers link is down at the bottom of the next page. Click this, and you can find a form that allows you to search job opportunities near you. When you find the right career for you, select it, and then begin the application. This can take about an hour to complete, so make sure that you give yourself enough time so you aren’t rushing through it to finish it. Be thorough and complete with your answers. At your interview, you should dress professionally, regardless of the position that you are applying for. This is a customer service job, and even though you will likely have an employee uniform supplied for you, your goal at this stage is to show that you can represent the company in a professional and courteous manner. Dressing nicely and speaking politely is an easy way to show this with your actions right off the bat. Bring a copy of your resume, and be sure to ask any questions that you have had at the end of your interview. This shows interest in the job and determination to succeed.